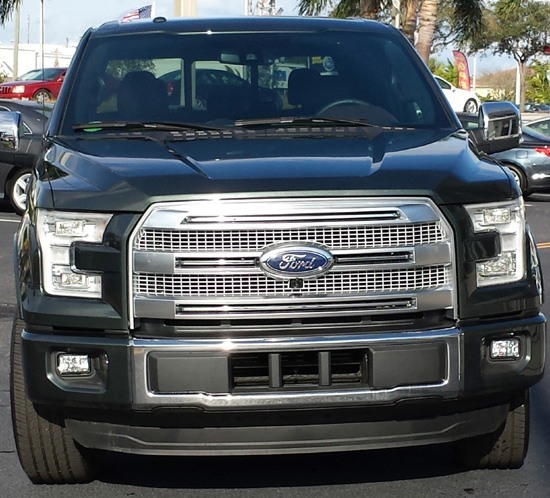 Our friends at Mullinax Ford West Palm in Lake Park, Florida invited us for a photo shoot of the new 2015 Ford F-150 Platinum 4x2 Supercrew with an aluminum body and the new EcoBoost engine. This truck had just landed on their lot off the transport truck. See our photos and review below of this top of the line SuperCrew truck. 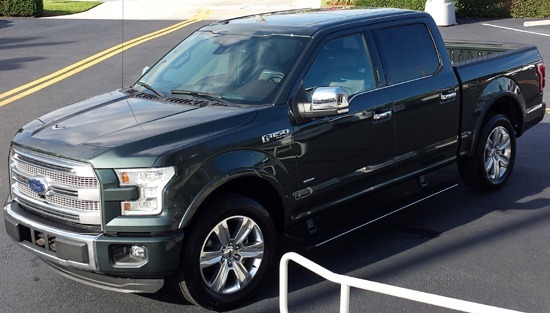 What's on the new F-150 pickup truck? 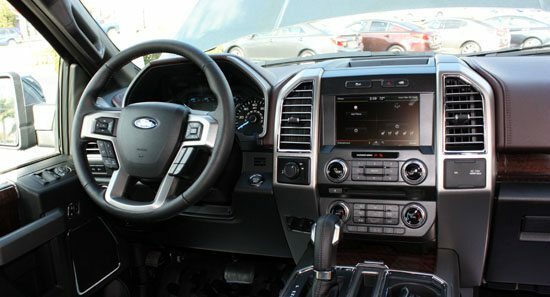 Our truck here is the top of the line F-150 and has a window sticker MSRP price of $56,795, which includes two $500 discounts, one for the Platinum Luxury package, and one for the Technology Parking Assist and Cruise Control discount. Destination charge is a whopping $1,195. We were surprised to see a discount at all on a hot selling new vehicle. Our truck came with Equipment Group 701A, a $2,450 option, which includes the Platinum Series; chock full of luxury and technology extras that will make you drool. Our Platinum Series truck had a 6 1/2 foot cargo box. Ford's web site indicates the 8 foot box is not available on the Platinum. Our truck also had the SelectShift automatic transmission with Progressive Range Select, giving better fuel efficiency at higher gears. The truck we photographed here is a brand new somewhat controversial new design, using military grade aluminum alloys in the body including the doors, the box (the rear bed of the pickup truck), the hood, the cabin and the cowlings. The bottom frame of the truck is still made of high strength steel with 8 cross members. Ford claims this truck is 700 pounds lighter due to the use of aluminum which costs about 3 times that of steel, and they claim it has 22% better gas mileage, coming in at 17 MPG in the city and 24 MGH on the highway. Starting at the rear of the truck, you'll notice the newer 3-dimensional carved look of the tailgate. 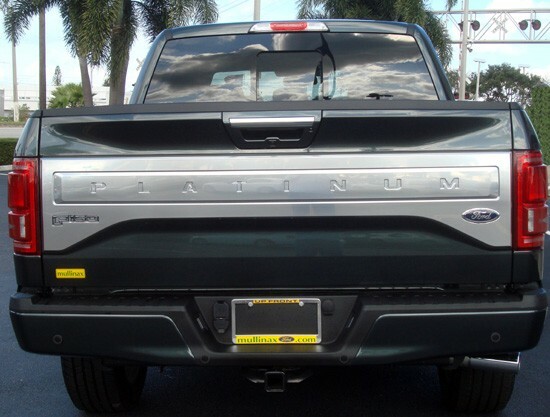 The 2014 model had a somewhat flat tailgate with not much detail, but this new Platinum version screams out a bold new leap forward. You'll note the very effective corrugated shape of the walls and floor of the aluminum flatbed box, which adds more strength to the aluminum box. 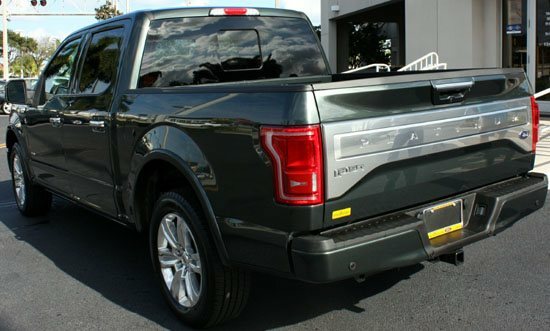 Some people we spoke with at the Ford dealer preferred the older flat tailgate, but I like this newer design and shape. One of my favorite features of the new Ford F-150 is the Remote Tailgate Release, which softly lowers the tailgate from your remote. Remote start is another included feature. Along with this, a new feature called the Tailgate Step with lift assist is very useful. 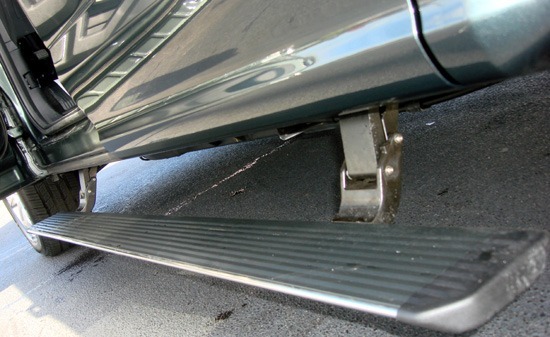 The step slides horizontally out of the top of the hollow tailgate once it has been lowered. Now you can step up into the back of the pickup instead of climbing up into the box. Just slide it back into the tailgate when you are finished. Also deployable box side steps are available on all cab configurations. You can spend an hour just standing at the back end of this truck counting all the new features. 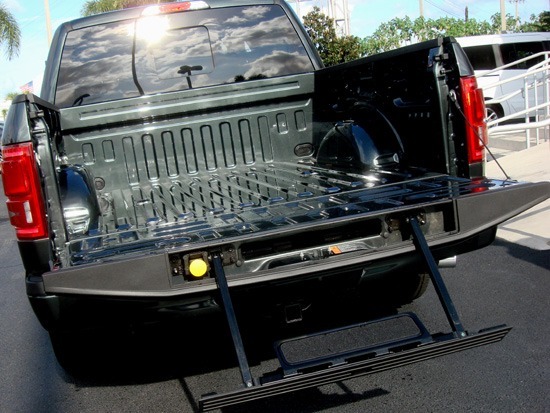 Long overdue is the automatically locking tailgate; when you lock the doors, the tailgate will lock also, preventing thieves from easily stealing your $3,500 tailgate. 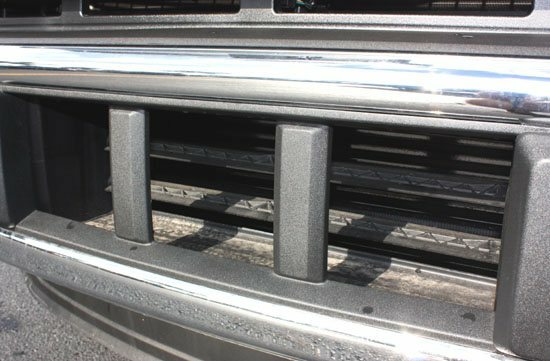 Ford dealers have a huge problem with removable tailgate theft on their lots, and this should cut that down dramatically. 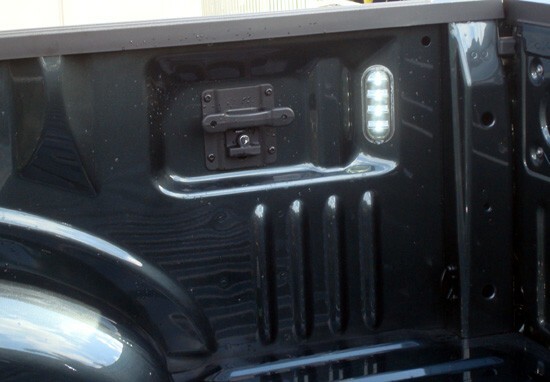 At the tailgate handle, you'll notice an LED light next to the backup camera, which lights the way for you in the dark. See the photo below. Danger Will Robinson: Let me give you a warning here, the backup camera may look just like the door lock, but don't be fooled! I wonder how many people are going to scratch up their backup camera, thinking they are inserting the key into a lock. The photos show below how decked out the rear end is with connectivity. There are 2 connector ports for connecting to trailers with this Class 4 towing hitch. There is also a key lock for your spare tire, located under the box. Take a look into the box and you'll see some choice features on the Platinum Series. There are LED lights in the box to assist you while loading in the dark. 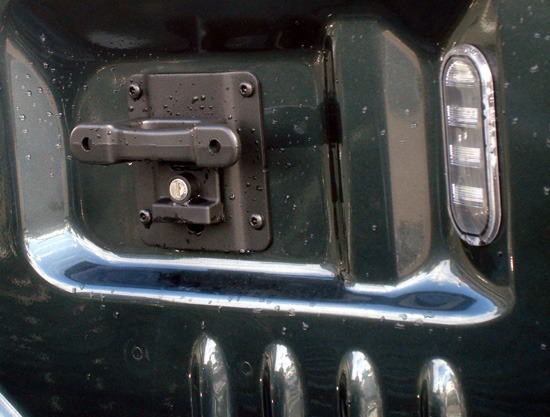 There are cargo box tie-down hooks, with key locks so you can tie down ATVs or other equipment. 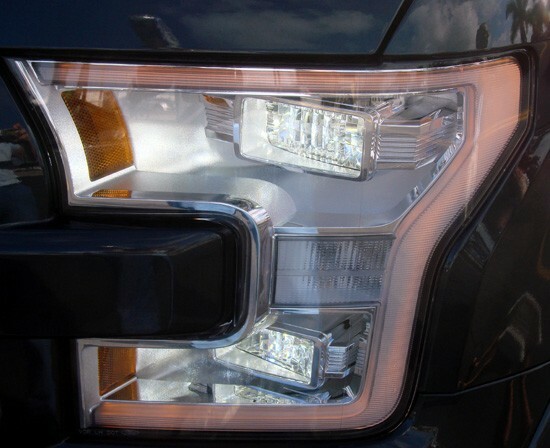 You can see the photo below shows one of many sensors that Ford has integrated into this truck all around the body. 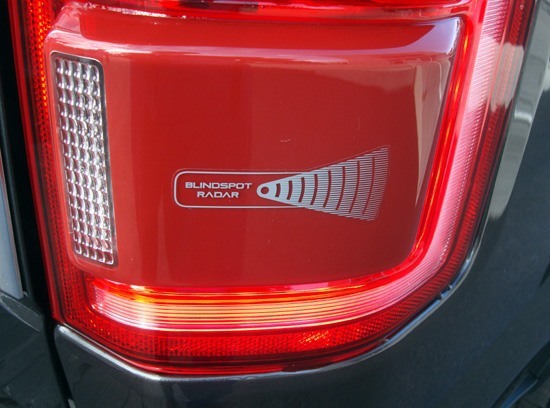 One system is called BLIS (Blind Spot Information System) with cross-traffic alert. 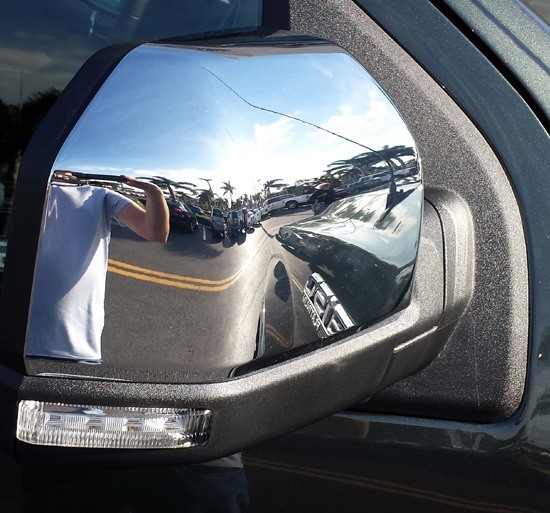 This gives us a signal in the outside mirror if a vehicle is in our blind spot. BLIS also gives us an audible alert if a vehicle is detected passing behind your truck when you're slowly backing out of a parking spot. The tail lights house the Blind Spot Radar. Walking toward the front, we see the SecuriCode keyless entry keypad on the driver's side door, and the Easy Fuel cap-less fuel filler system. I have always hated gas caps, I keep dropping them. 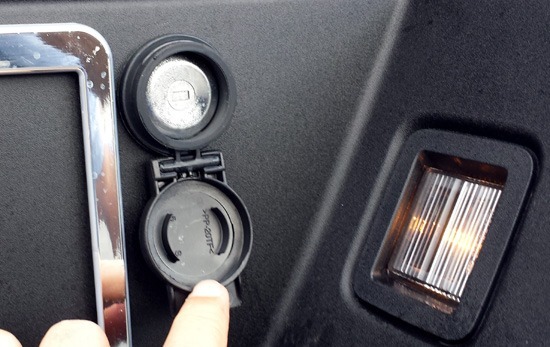 This F-150 solves the gas cap issue by eliminating the gas cap altogether and Ford replaced it with a spring-loaded door that allows you to insert the fuel nozzle into the tank to fill up, no screw cap is needed. 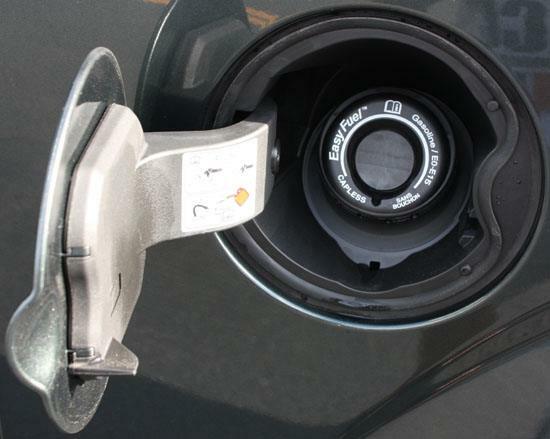 It automatically seals after the fuel nozzle is removed, so you have reduced fuel evaporation at the pump. Our truck here came with the $1,295 twin panel moonroof. This new dual-panel moonroof gives us a larger opening for all passengers and is available only with the 4-door SuperCrew models. 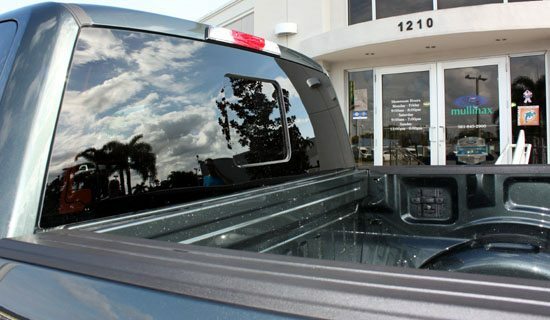 The rear window now has a Power sliding glass portal with privacy tint and defroster. I bet that's expensive if it ever breaks. They should just rename this truck the F-LED, because there are little LED lights hidden everywhere. 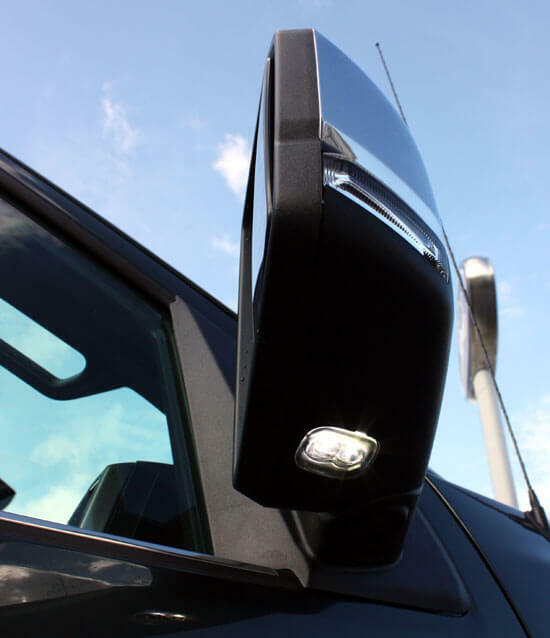 The mirrors have LEDs in them, part of the LED Security Approach Lamp system. This Illuminates the area at the front doors and fenders, using sensors to detect your approach. 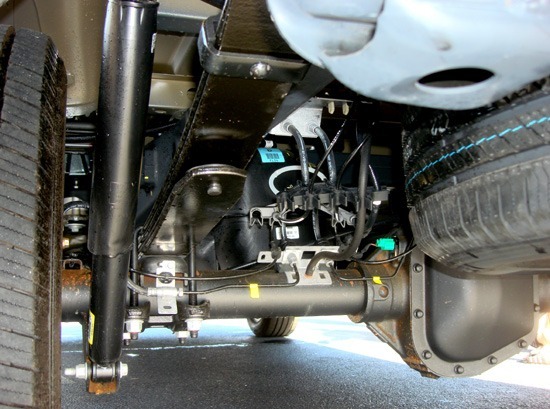 Our truck also has the automatic Power-deployable running boards, which is only available on the SuperCrew versions. 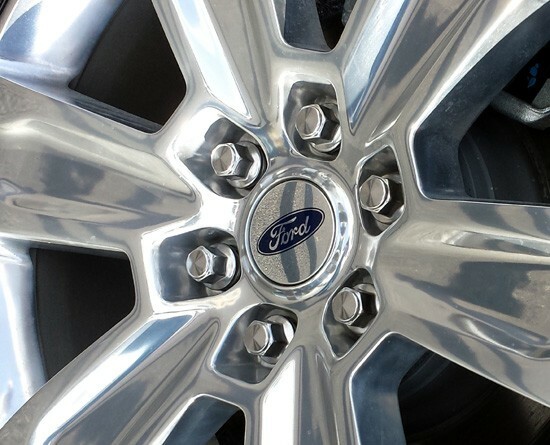 The standard F-150 Platinum wheels are made from 20" polished aluminum. 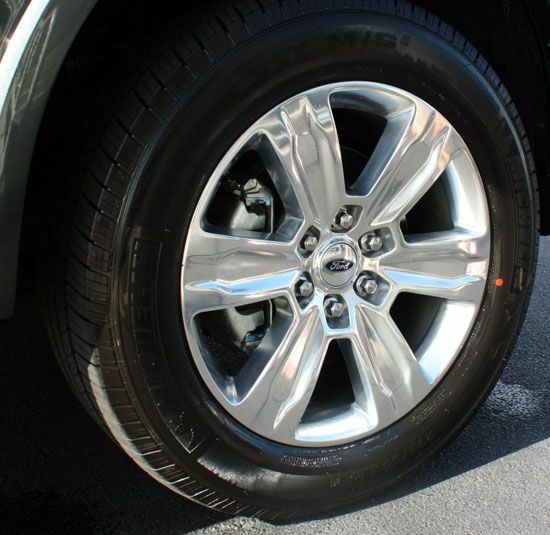 The tires are 275/55R20 all-weather tires. You will find more exterior body sensors placed near the tires too. The front of this truck is big and masculine, wimps need not apply. Ford designed in the Quad Beam LED Headlamps to compliment the LED Tail lamps. For some reason I keep replacing burnt out bulbs on my other vehicles, so the long life and reliability of LEDS should really bring you a stress free life. 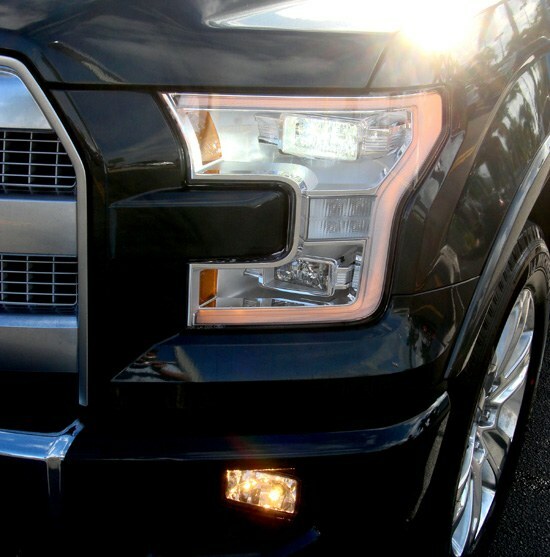 The F-150 also has fog lamps to improve visibility during foggy or misty road conditions. The photo above also shows the louvers in front of the radiator. These close at highway speeds when you don't need as big of an opening which improves fuel economy. 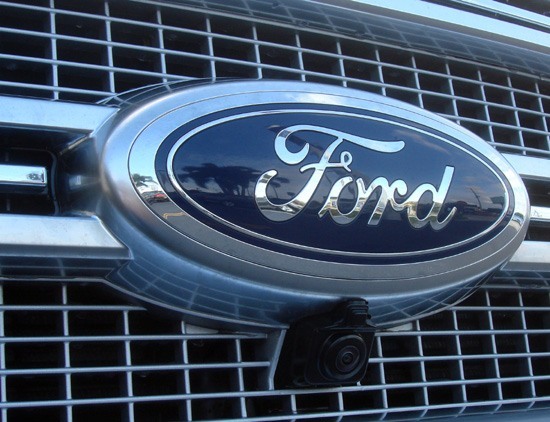 The front Satin Finish Three Bar Style grill with Chrome Accents has a forward looking camera just beneath the Ford logo emblem. This is all part of the 360° Camera with Split-View Display, which uses four cameras to give you one seamless 360° view all around your truck. It's like a rear view camera on steroids. 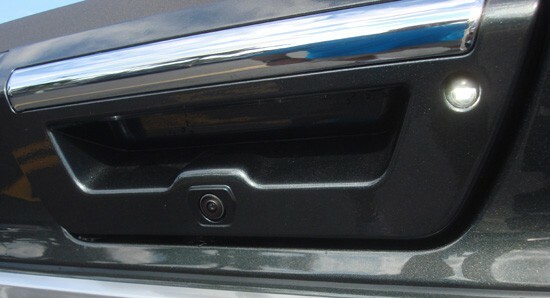 The cameras are located in the grille, tailgate and on the bottom edge of both left and right side view mirrors. The 360° system lets us see all sides of the truck by stitching the four images together and showing these images on the screen. 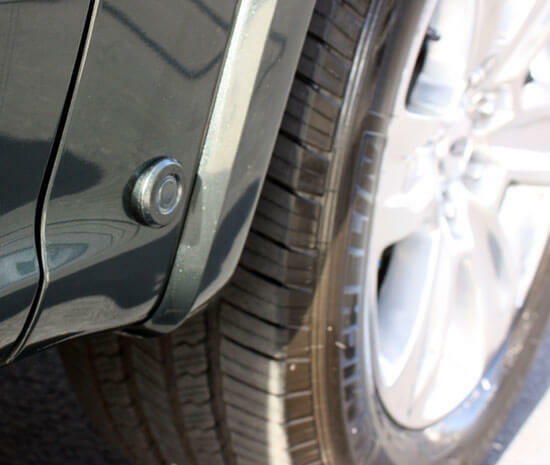 The truck also includes a hitch assist feature that gives us a sight line rear camera view on the display display to help direct your hitch ball to the trailer receiver. Now you can feel like you're on the Space Station about to dock your rocket. 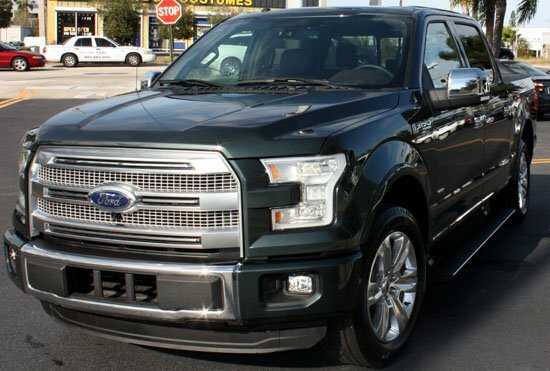 This F-150 Platinum Series truck also has a 3.5L V6 EcoBoost® Engine, Ford's new critically acclaimed engine series that gives more power than ever, with improved fuel economy. As Ford calls it, it has "The efficiency of a V6 and the power of a V8." 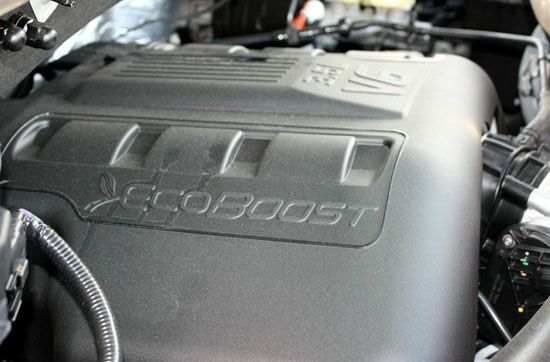 This EcoBoost® engine has 365 horsepower @ 5,000 rpm, and 420 lb.-ft. of torque. It's such a mind blower to see a truck this big without an 8-cylinder engine. They don't even offer 8 cylinder engines anymore on the F-150 from what we hear. You can be absorbing in all the features on the outside of the truck and forget this vehicle actually has an interior too. The cab inside looks like the Space Shuttle. Inside this Platinum Series truck, the leather and wood upgrades are instantly noticeable, along with a leather wrapped steering wheel. Ford has turned me into a snob now with this series and now I'll never look at a standard F-150 again. The dash console contains an 8" center stack touch screen. This screen gives you all sorts of information, and includes the seat positions and turning the seat massage on. 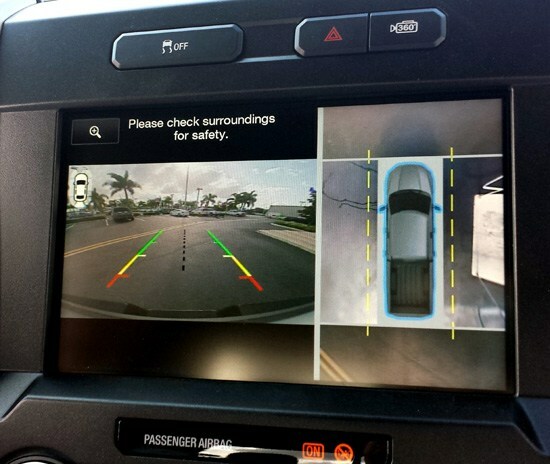 The screen also displays the rear view camera or the full 360° camera view if your truck is equipped with it. Elsewhere in the interior, we have heated and cooled driver side and passenger seats, and adjustable pedals with memory, and a Sony Premium Stereo with single CD and HD radio. 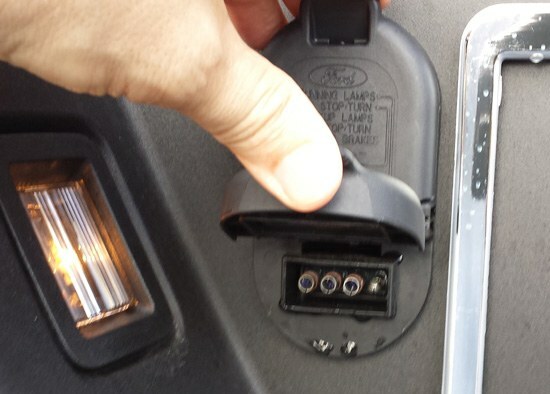 One other very useful feature found on the Platinum Series F-150 trucks is the 110 volt 3-prong plug in power outlets. There are 2 of these outlets, one is located on the center stack up front, and the other is located on the rear of the flow through console for the benefit of back seat passengers. There is also a rear cigarette lighter power port as well. 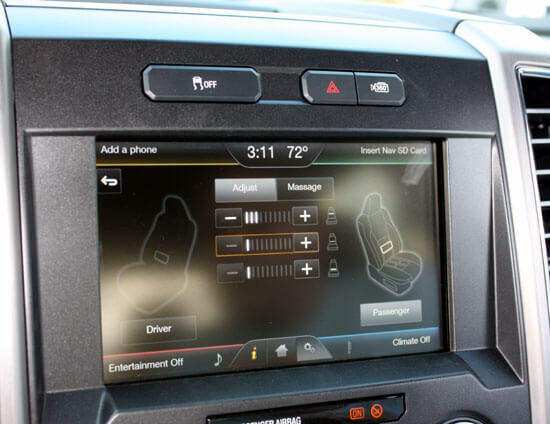 Now you can charge tools, or operate lights and machinery from your F-150 at a job site. You can also sync with MyFord Touch. Inflatable rear safety belts are included in the SuperCrew models. These inflatable safety belts help distribute crash forces across more of the torso than the traditional skinny safety belt. 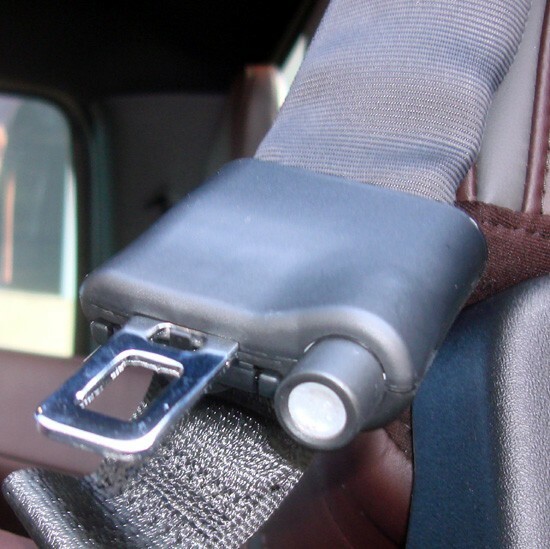 By inflating during a crash, these belts end up looking more like a beauty contestant sash than a seat belt. The rear row also has the fully flat load floor with more room for storage underneath the rear seats. There is no transmission hump in the back. As with any new design there will be people who like this or hate that, and new technologies to get accustomed to. The truck certainly seems to make a lot of audio alerts and warnings. You don't have to pay $57,000 either, they have models in the sub-$30,000 range, but you'll give up some of the best options too. Last week, the guys over at Edmunds took a sledgehammer to the right rear quarter panel of a new F-150 to see if aluminum costs more to repair. The truck was repaired pretty well, but most body shops charge twice as much to repair aluminum than steel. It also takes twice as long for the shops to repair aluminum. 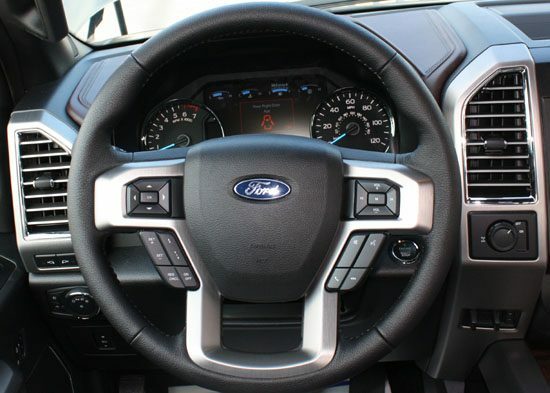 Overall the design features on this truck are hard to pass up, but the Platinum trim level might not be practical if you're going to have lots of tools going in and out of the truck on that fancy leather. We were impressed enough to want one. 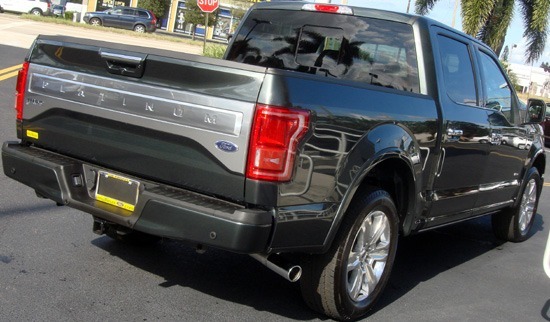 Once again, a special thanks to our friends at Mullinax Ford West Palm, one of the good guys!